If your cat strains in the box, pay close attention for hematuria. Sometimes it's tough to own a cat. Finding blood in your precious cat's pee is extra-tough, not to mention scary. Hematuria, or bloody urine, means it's time for a trip to the veterinarian. An underlying condition is causing that blood to be there, and a veterinarian can find the cause. A range of conditions can lead to blood in your cat's urine. The Hematuria could be related to a bacterial infection of the bladder, or a parasite in the urinary tract, though the latter is rare. Certain types of medications and injuries may also be the culprit. Unfortunately, some very serious problems could be the cause. For example urinary crystals, or cancer of the kidneys or urinary tract. Crystal formation can lead to potentially fatal blockages if left untreated, and cancer can destroy the typical function of the affected organ. For some cats, blood in the urine is the only sign something is wrong. For others, it's just one of many issues related to elimination. 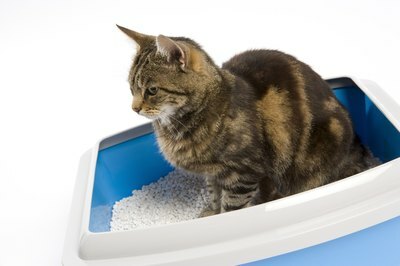 To find out for sure, watch Kitty when he's in the litter box. Does he strain to pee? Does he pee too often or not enough? Does he meow or make pained noises when he tries to go? Or maybe he pees outside his box or licks his genital area to an excessive degree. These are all signs of urinary problems that can accompany hematuria. If you notice any of these signs, don't hesitate to consult a veterinarian. Problems peeing means there's a serious underlying issue that needs to be resolved. Only a veterinarian can determine what's going on and come up with an appropriate treatment. So how does your veterinarian determine what's causing the hematuria? The first thing he'll likely order is a urinalysis to test the chemical composition of Kitty's pee. He may also order a full blood panel, which will allow him to see if there are any anomalies in red and white blood cell counts. He'll feel the kitty's abdominal area and may order an X-ray or ultrasound to determine if there are any bladder stones, tumors, growths or genetic abnormalities. Only a veterinarian can determine an effective course of treatment, and that treatment will depend on the underlying cause of the bloody urine. Antibiotics should help with bacterial infections. If kitty has stones or crystals in his urethra, surgery can remove them and he'll likely need to eat a special diet to balance the pH of his pee and keep the mineral makeup correct. What Is the Problem When a Cat Has a High RBC? What Is Absolute Lymphocytes in Cats? What Type of Blood Do Cats Have?